Car won't start. "EPC" light comes on. Thread: Car won't start. "EPC" light comes on. I had a similar issue happen to me recently. My 1.8 GLS suddenly died while I was sitting at a red light. Battery light and CEL came on right before and then it wouldn't accelerate. Turned it off and tried to start the car again, nothing. Someone jumped my battery for me and I was able to get it home, but the EPC light stayed on, and I still had numerous electronics working despite the car thinking the battery wasn't functioning properly. I ended up ordering a Bosch replacement ESS (crank position sensor technically). Just put it in yesterday, car started with no problems and has been running fine. If anyone else ever has this issue, and wants to do the repair themselves, it's definitely true that you DON'T have to drain the oil or remove the oil filter. I was able to reach it by just disconnecting the coolant reservoir and reaching down and behind the oil filter with a 10mm socket. !! I NEED HELP !!! My 2002 VW Passat wont crank and wont start since 3/28/19. i drove my car 50miles to work, and at the end of my shift i tried to start it and it wouldnt crank or start. so i push started it to advanced auto from my job at the NAVY Depo where i work, and they pulled a code P0688. Which the pocket scanner defined as "Module/ Powertrain control module power relay sense circuit / open. So i took my car to the dealer last because im not an auto electrician and assumed they would find the issue ASAP. The dealer has had my car since 4/1/19 until present and they still dont know what is wrong with my car. i spike to them today asking them to close my car up and that i am coming to get it. they told me they checked the ECM, the starter and several wires which is vague... they also said they jumped a relay called J484 "relay 484" and the car cranked but didnt start. i am picking my car up tomorrow... but need help, has anyone else had a problem like this and able to help me! In many cases, it's a shorted wire in the coil pack harness (1.8T). It can be a blown fuse or a bad ECU relay as well. If the car ran when jumped, it should not be a bad fuse or relay, but that is what the code is for. Perhaps the relay has bad solder at one of the joints inside and fails intermittently. I had that problem on my 1.8T and it usually failed when hot. The car would start when cold. This reminds me of a frustrating troubleshooting episode with my wife's old Audi 5000 Turbo, which occasionally would not start due to the fuel pump not running. I checked the fuel pump relay contacts, which were dirty, but cleaning didn't fix the intermittent problem. That car's FP relay was inside the engine compartment, and being a pre-OBDll car, had a rudimentary fault code system which involved putting a spare fuse into a socket on the relay housing. This would also cause the relay to click and run the pump, but one time it just clicked, without the pump turning on. I tapped on the relay cover, and the pump started up. Magnifier inspection of the relay's little circuit board revealed broken and Oxidized solder joints. Fresh solder and flux solved that one. Evidently, the atmosphere in the engine compartment led to the dirty contacts, which became like resistors, which then cooked the solder repeatedly until those joints had no strength. I had many issues with my 5000 Turbo. It would not start when warm. Hit starter, sometimes worked, sometimes not. Pulled and checked starter, it's good. 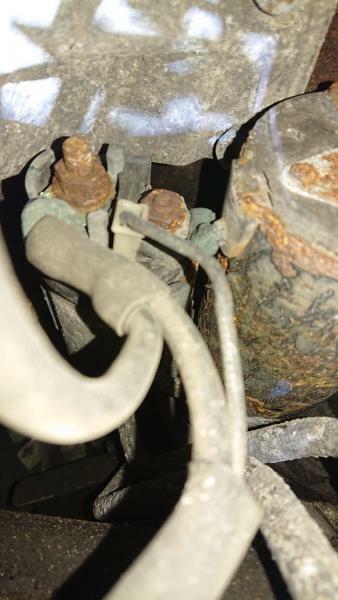 Checked wiring and found corrosion about 24" up the positive lead, inside the insulation. ok! i am going to get my car from them today.... and check wiring from starter, fuses and relays under the hood next to the ecu. and this did take place when it got warmer. so hopefully its a solder issue. thank you everyone for your suggestions i will let you all know how i fair. i recall before taking it to the dealer fuse 32 had no volts with the key in the on position... and fuse 34 had 1.79 volts in the on position. is anything significant about either one of those? I liked this because I have seen this happen more than once, two geographical areas "rust belt" and warm coastal areas. So decieving in nature,no pun intended. cChief22 has gone through a few threads diagnosing starting issues. Also try cleaning your grounds. Last edited by BlackFist13; 04-10-2019 at 11:52 AM. aside from being the brushes worn out inside the starter ,physically look at that 1/2" to 1" inch long shunt wire carefully ,if it does not look congruent/healthy for lack of a better term it is suspect, you might be able with a light and mirror be able to get a looksie at it before going deeper, unhook ground on battery.Welded mirrors a distinct possibility! Also as previous poster correctly suggested check engine to frame grounds as the starter gets it ground (other side of electricity) from the fact it is bolted to to engine. physically look at that 1/2" to 1" inch long shunt wire carefully ,if it does not look congruent/healthy for lack of a better term it is suspect, you might be able with a light and mirror be able to get a looksie at it before going deeper, unhook ground on battery.Welded mirrors a distinct possibility! Also as previous poster correctly suggested check engine to frame grounds as the starter gets it ground (other side of electricity) from the fact it is bolted to to engine. thank you, for everyone's advice, i have been swamped with work... but i will be looking for everyone's suggestions this weekend.